James O’Neill was a contemporary of Joseph Haworth. Both had early formative experiences acting with Edwin Booth, both showed promise in Shakespearian roles, and both had great success as Romantic actors in melodrama. For actors, roles like "Dantes" in The Count of Monte Cristo or "Elliot Grey" in Rosedale made enormous demands emotionally, physically, and vocally. Classical training was of the essence to play these characters. However, the material lacked the depth, the contradictions, and the profound mysteries of great classical characterizations. Quickly, the roles could be thoroughly explored and would cease to provide the player with inspiration. Repeating them season after season was a feat of discipline, technique, and physical fitness. James O’Neill played Monte Cristo more than six thousand times. In son Eugene O’Neill’s Long Day’s Journey into Night, James expresses profound regret at having given up on his artistic ideals. Joe was subject to similar temptations and pressures. The public’s demand for Rosedale was insatiable, and in 1887 Lester Wallack sent Joe on a national tour of the play, and Joe’s salary skyrocketed. He was billed as "The Illustrious Young Actor," and was given a major public relations build-up across the country. In the course of one season, Rosedale had several New York bookings. Because long runs were rare in those days, a production would play one to three weeks in New York then hit the road for a while, returning to the city as often as demand and logistics allowed. Joe’s revival of Rosedale was a runaway hit. He could have easily followed the example of James O’Neill or the beloved Joseph Jefferson and become a rich one-part actor. But Joe was restless artistically and willing to take risks. Sometimes Joe’s gambles paid off. He took a chance on a new American play called Philip Herne, and in the title role scored an artistic and popular success at the Fifth Avenue Theatre in New York. 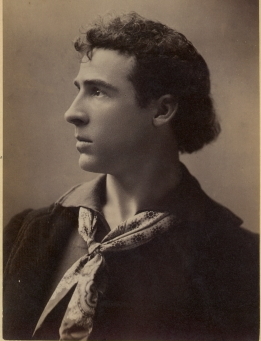 At the end of 1888, he was starring in Paul Kauvar, a romantic costume drama by Steele Mackaye. The play achieved a phenomenal run at the Standard Theatre in New York, and then toured nationally. Unlike "Elliot Grey" in Rosedale, Paul Kauvar was tailored for Joe, and his name became synonymous with the French revolutionary hero. Again, Joe was presented with the prospect of a single role providing a lifetime of employment. And again, Joe moved on. Maurice Barrymore had a huge success at the Madison Square Theatre in a short play entitled A Man of the World. It was performed on the same evening with a three-act farce called Aunt Jack. Barrymore’s leading man qualities were deemed unsuitable for the star comic role of "S. Berkeley Brue" in Aunt Jack, but when Joe starred in the touring edition, he played in both plays. It was an astonishing display of versatility. In 1891, Joe headed his own company in a neoclassical repertory of The Leavenworth Case, St. Marc, Fra Diano, Ruy Blas, and The Bells. Despite Joe’s popularity in these vehicles, he was snidely treated in a Philadelphia review. The paper first quoted McCullough’s telegram that urged Joe to write his name "on the immortal pages of Shakespeare," and then charged that Joe had "descended" to The Leavenworth Case, Rosedale, etc. The article however unfair foreshadowed a personal and professional disaster for Joe. The play was alternately called The Crust of Society and The Froth of Society. It was an English adaptation of Le Demi Monde by the younger Dumas. It was a script that just wouldn’t jell, and Joe struggled to make the leading role of "Olivier de Jalin" his own. However, it did please less discriminating audiences because it offered a certain amount of smutty titillation, and Joe’s name assured good attendance. Following its New York run, it went on the road. Joe’s leading lady was a beautiful German actress named Emily Rigl, and in Montreal she stopped in the middle of a scene and announced to the audience: "Mr. Haworth has made my life unbearable for the last eight weeks and I will not stand it any longer." Joe stayed cool and told the audience that the great trouble lay in the fact that Miss Rigl hadn’t received the amount of applause and encouragement which she thought due her. Rigl was white with rage after this remark and the curtain was rung down. Somehow, they managed to get the play started again, but in the third act when Miss Rigl’s character said: "I have a bone to pick with you," Joe couldn’t resist giving a knowing chuckle. The next day, Rigl elaborated to the press that Joe had made violent love to her, hinted at a marriage, while sending word to the advance agent not to star her in any future printing. The Crust of Society closed in Montreal and cancelled the rest of its bookings. Joe handled himself pretty well with the Montreal press throughout what was obviously an unseemly squabble and serious breech of professionalism. He went on to Boston and started rehearsing yet another unpromising opus called The Princess of Tragedy, but shortly before he was to open, he completely cracked up. A press report stated he "was suffering from ‘brain fever’ and delirious all the time. He imagines that he is "Hamlet" and recites constantly the lines of that character. At time it is said he becomes violent and is restrained with difficulty from doing himself and those about him injury. His friends say they fear he will never be able to appear on the stage again." Joe was physically and emotionally exhausted, probably drinking too much, and in the depths of despair at having lost his way artistically.